At Thursday’s question period in the provincial legislature, NDP education critic Merit Stiles took Premier Doug Ford to task over his government’s controversial plan for sweeping education reforms that could see significant funding cuts. Stiles was not alone in her effort to bring the Ford government to its knees. Social media has been blazing with youth activism for weeks, around the StudentsSayNo movement, a province-wide walkout that took place Thursday afternoon in cities and towns across Ontario, including Brampton. The scene surrounding one local high school that let its students out just after lunch to advocate for themselves and their future was reminiscent of university campus protests. The teenagers huddled together in a large group, chanted slogans and held their signs high for anyone to see. “No to cuts, no to cuts,” echoed into the warm afternoon air. “F*#K Ford” was blazoned across one sign that cut to the point of their frustration, as their futures have suddenly been thrown a curve ball. The Pointer obtained permission from parents to speak with their children. “These cuts that Doug Ford proposes are absolutely ridiculous. 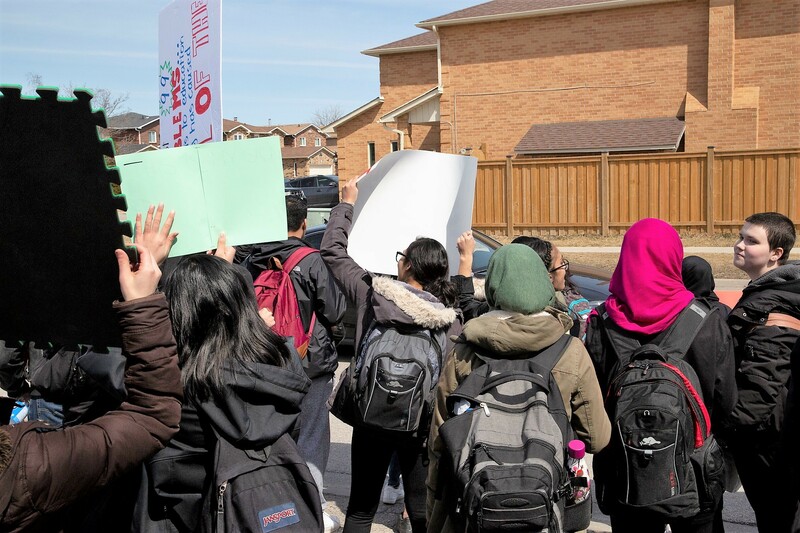 They’re going to put every single one of the about 300 people out here today, students, in jeopardy of their future,” said honour student Nicholas Gadanyi, who attends Brampton’s Heart Lake Secondary school. The PCs plan to increase average class sizes in Grades 4 to 8 by one student and in high school classes will on average jump from 22 to 28 students, a move that many educators say will cripple pupils and teachers. Twenty-nine Brampton schools registered to take part in the walk out. Sixteen year old Gadanyi, who helped organize the protest for his school, says that large class sizes are already an everyday part of his school life and his teachers are stretched thin. “Some of us are already waiting up to a month to get tests and assignments back from our teachers… at the end of the day when these cuts go into place, our teachers can no longer handle the amount of students in our classrooms. We will suffer,” Gadanyi told The Pointer. Nathan Benoit is seriously thinking about law school and now worries the Ford government’s changes might jeopardize his future. “These increased classroom sizes make it very hard for students to learn, make it really hard for teachers to have one-on-one time with students. I know specific teachers who mark excellently, but will not be able to do so because they will be up all night marking papers,” Benoit told The Pointer. Minister of Education Lisa Thompson and her government announced that high school class sizes will be increasing by about 30 percent, but it’s likely that some will see even larger increases. The planned changes will also place greater emphasis on online learning. Starting in the 2020-2021 school year, students will be required to take four e-learning courses for 30 credits toward graduation. Esha Modi dreads the possibility of being forced to take online classes. She says she’s a hands-on learner and needs the individual focus to succeed. “I’m not suited for online…. I would never be able to get the grades I want… It’s not fair for me,” she told The Pointer. The planned changes are causing anxiety among school boards, educators and parents. Larger class sizes mean students will not be able to get the individual attention they require and could mean mass layoffs of teachers, critics have claimed. Ford did not address the question directly and instead said “we will have the lowest class sizes in the entire country.” His claim does not appear to be true. A report by the BC Teachers Federation says that the average high school class size is 22 students, a far cry from the 28 Ford claimed the western province maintains during question period. Alberta does not have a hard cap, but aims to bring class sizes down to 27. The Ontario Secondary School Teachers' Federation has stated the move will impact about 5,500 teachers, roughly 20 per cent of the total complement in public boards. 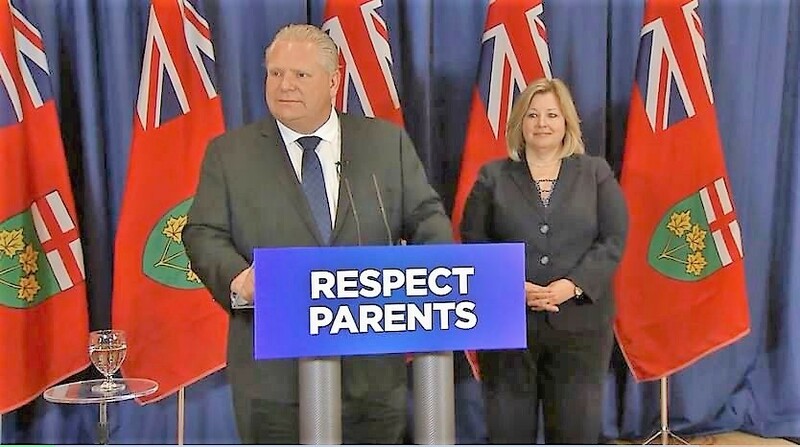 However, The Ontario English Catholic Teachers Association has said 5,000 teachers will be lost in Catholic schools alone. It's likely that numbers won't come into focus until the changes are implemented. Thompson has said staff reductions will come from retirements and voluntary leaves. She said $1.6 billion is being set aside to support "teacher attrition" so layoffs can be avoided. Critics have said the move does not bode well for future teachers currently planning to enter the system, especially those already preparing to become high school teachers. It's unclear how teachers' colleges and universities plan to adjust. Thompson last month said, “Not one teacher, not one, will lose their jobs because of class size strategy.” Peel District School Board Chair Stan Cameron directly contradicted that statement when he told The Pointer that job losses have already occurred. “Quite honestly, we are worried, our families are worried, students who understand the challenges we might be facing are worried and certainly school staff, all school staff, are very worried and anxious,” Cameron said. “Funding cuts from the province have already led to the loss of nearly 50 teaching positions and 30 early childhood educators,” Cameron said. A school board in the Guelph area recently issued lay-off notices to 54 elementary teachers because of funding cuts, including some to specific programs that will soon take effect. 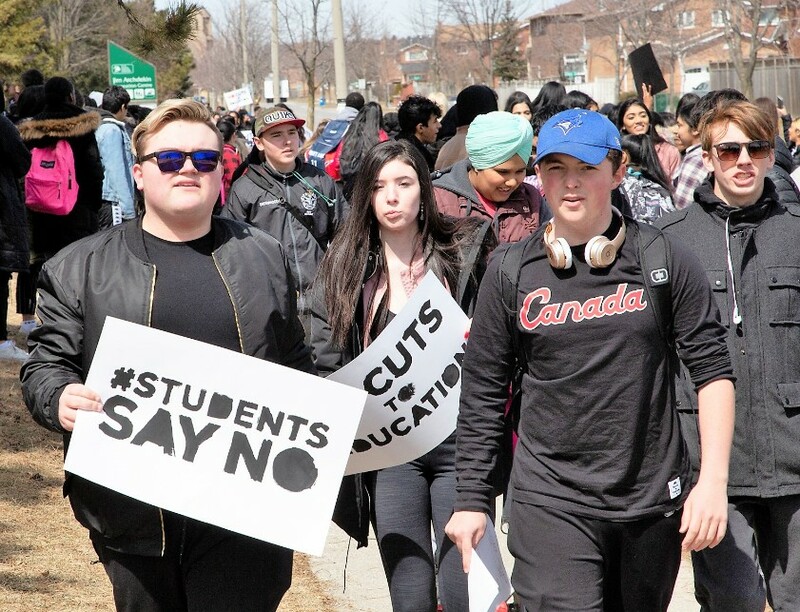 MPP for Brampton North, Kevin Yarde, was present at the Brampton Heart Lake School protest Thursday and mingled with the students. “The minister of education keeps coming back to the deficit. We understand that there is a deficit but you can’t cut on the backs of students,” he told The Pointer. Despite the anxiety of the students, the atmosphere was jovial and energized. Students chanted slogans and waved their protest signs at passersby. Nearly every driver that went past the protest honked their horn in support of the youths. Director Mazzorato, in a letter to parents, threw her support behind the students and their walk out as well. “The DPCDSB honours student voice as integral to overall student-achievement and well-being. Our partnerships with our student senates and other student voice groups helps to inform our practice and areas of priority related to faith-filled, safe, caring and inclusive Catholic schools,” she said in the letter.